ColorAssist Color Names | FTLapps, Inc. 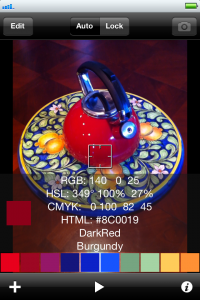 Both ColorAssist Free Edition and Color Assist (the paid edition) include nearly 900 color names used to identify the colors seen by the iPhone. ColorAssist gets its smarts thanks to everyone contributing to Wikipedia’s List of Colors. To ensure that the names are useful to color blind people, we have augmented that list for a few of the color names we felt were ambiguous (e.g., Glaucous, Glitter). For additional information, check out http://en.wikipedia.org/wiki/List_of_colors.